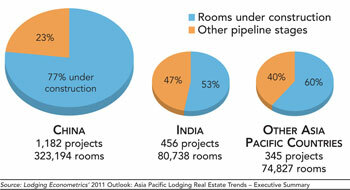 The Asia Pacific region continues to see massive lodging development led by China, which has the second largest pipeline of hotels in the world (behind the United States), with 1,182 properties in the works. Combined with India, projects from the two Asian countries represent nearly 405,000 rooms, which is 33 percent of the world's total pipeline, according to a new study from Lodging Econometrics. Additionally, for all other Asia Pacific countries, the number of planned projects rose for the first time in seven quarters, to 345. To see the full study, go to bit.ly/gT7s2E.